^ [Improvements] Fix issues for the browser IE 8 and below. # [Bug Fixed] Cannot set property 'innerHTML' of null. ^ The Olympic Games 2016 have been removed from the default XML data, because have been started, and have been replaced by Fifa World Cup 2018 in Russia. ^ Some fields are not required anymore. ^ The default XML data have been changed. 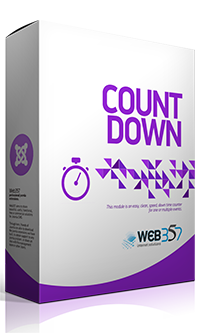 + CSS file has been added "assets/css/mod_countdown.css", for your custom styling. + align, color, and fontsize parameters has been removed because you can get a nice result if you add the "